Laptops, phones, tablets and television are dominating today’s media; let’s face it, we’re living in a multi screen world. 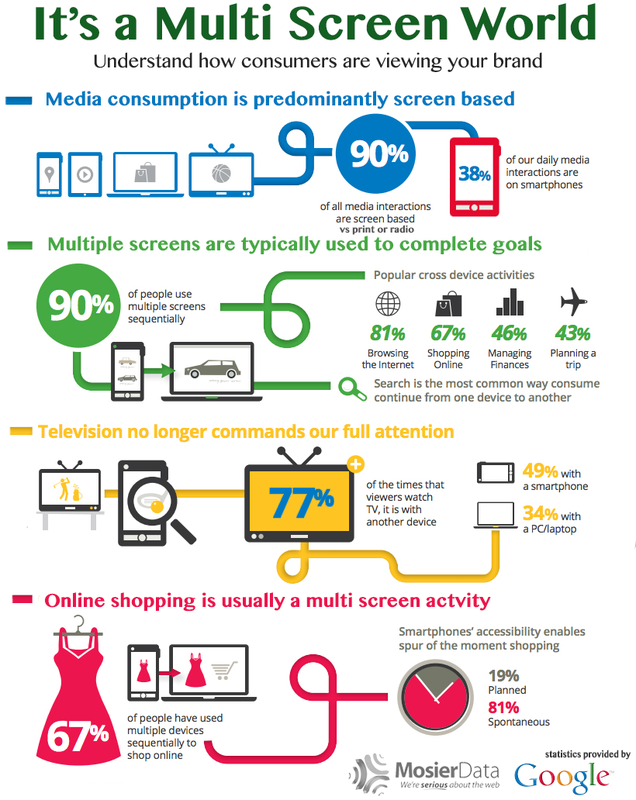 A whopping 90% of all media interactions are done via some sort of screen. No matter how your media experience happens, there is a good possibility you are using multiple screens to accomplish tasks like shopping, researching products, booking vacations and watching your favorite shows. In the infographic below we take a closer look to uncover the most common ways people change screens to get stuff done: simultaneously and sequentially. 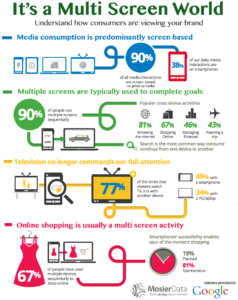 As consumers balance their time between smartphones, tablets, PCs and televisions, they maximize their experiences and achieve their goals on multiple screens. As this quickly becomes commonplace, understanding how it happens is vital for businesses. The popularity of sequential usage makes it necessary for businesses to allow customers to save their progress between devices. Saved shopping carts, signed-in experiences or the ability to email progress to oneself helps keep consumers engaged, regardless of device used to get to you. During simultaneous usage, content viewed on one device can trigger specific behavior on the other. Businesses should therefore not limit their conversion goals and calls to action to only the device where they were initially displayed.